From the beginning, Merrell’s mission has been to get more people outside. The Merrell Moab Collection has been an essential way we have been able to support our outsiders in enjoying nature and discovering the trail. At nearly 10 years old, the Moab continues to be our most popular multisport shoe. The classic Moab boot is built from the ground up with comfort and versatility in mind. 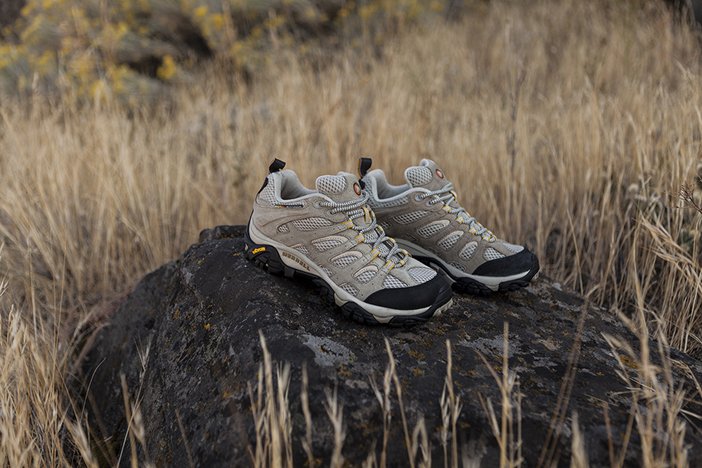 Our Moab Collection offers a signature fit with a snug, stable heel, a precise fit in the arch, and a roomy toe box for flexibility and comfort on the trail. A Vibram® multi-sport outsole with 5mm lugs gives you traction in any situation. A contoured midsole with Merrell air cushion in the heel provides all day comfort, and features organic odor control to keep things fresh. A variety of uppers – low and mid-height, ventilated, waterproof and GORE-TEX® – means we’ve got a Moab style for any adventure. Shop the full collection here. We couldn’t ignore the loyalty our consumers have for this shoe so we decided to grow the family. We just introduced the Moab FST, the latest evolution of the Moab Collection DNA. It offers the Moab comfort and versatility you love, in a faster, lighter package. Today we offer a whole collection of Moabs for all hikers. Take a look and see what one works for you! Don’t hesitate to reach out to us on twitter or Facebook for questions on what model is best for you. I’ve searched and searched and cannot for the life of me find what it is that “Moab” stands for on Merrell’s shoe descriptions. Is it an acronym of sorts, or an abbreviation of something? Maybe it’s just a designers name? The only thing that came up was Mother Of All Bombs… but that wouldn’t make sense. At least not to me, and I’m a pretty bright guy I think. I even have a pair of ventilators, and still don’t know what Moab means.